We once picked up a Queensland Blue pumpkin from a farm on the honour system* once and while it wasn't as sweet as the Japanese pumpkin or Butternut, the Queensland Blue is really a very nice variety of pumpkin and holds its shape up very well to being roasted. But there are only so many times you can eat baked pumpkin before you get downright sick of them, and I still had half a pumpkin to get rid of. The in-laws are not particularly fond of this pumpkin variety either. 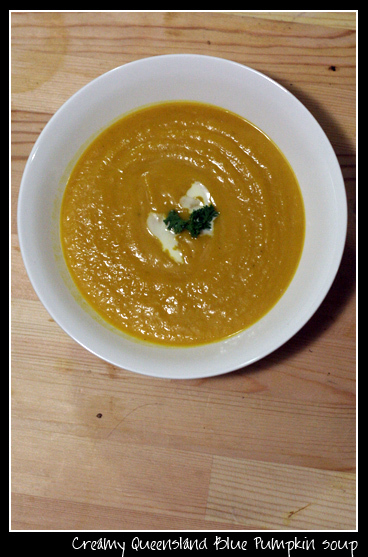 So I decided to have a go with pumpkin soup. Pumpkin soup is a great winter favorite and really quite simple to make. This recipe uses the Queensland Blue variety, but other varieties would work just as well. Japanese pumpkin would cook quicker, so best to keep an eye on the pot if you'll be using that instead. Melt the butter in a pot over medium heat and add the onions. Cook until they have softened and start to brown. Increase the heat to medium high and add the pumpkin pieces and enough water to half-cover the pumpkin. This pumpkin soup is extremely thick and will stick to bread like gravy. If you prefer a thinner soup, add enough water to cover the tops of the pumpkin chunks instead. When it starts to boil, lower the heat to simmer the pumpkins and cover with the lid. Depending on how thick the chunks, cooking may take 15-30 minutes. Test by sticking a fork into the pumpkin. When cooked, the fork will slide in and out easily. When the pumpkin is cooked, add the paprika, hoi sin sauce and cream. Stir well. if you have a whizz stick like this (we got one as a wedding present), use the steel blade attachment to mash up the pumpkin on low pulses. 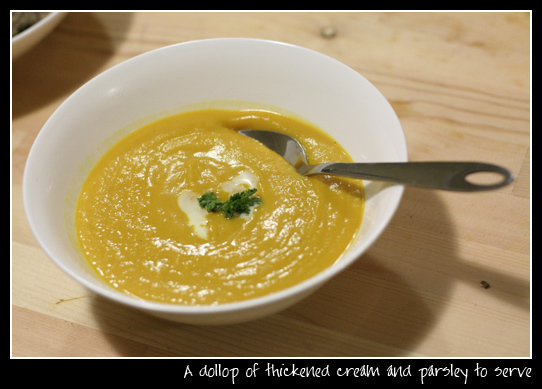 If not, use a potato masher to mash together the pumpkin and cream until the soup is almost smooth. Season with salt and pepper. Serve with a small dollop of thickened cream, sprig of parsley for garnish and warm bread. I usually put curry powder in the pumpkin soup. Gives it a bit of a kick goes really well as well.